I first came to Central America in the late 1980’s to work as a health worker and nurse for human rights organizations in refugee camps and orphanages in the war torn countries of Guatemala and El Salvador. I returned repeatedly over the next 20 years. I have lived in Guatemala, El Salvador and Panama and have traveled in Mexico and Nicaragua and many more countries around the world. I speak fluent Spanish and have a deep understanding and love for Central American culture. In 2003, when I moved to the San Rafael valley in Puriscal, Costa Rica, and created the Barking Horse Farm, I wanted to explore all of the trails around the area. I started by purchasing detailed topographic maps from the National University of Costa Rica. These maps, completely filled our large living room wall. I pored over them and lines were imagined and drawn, finding ways to get to new places and perhaps, one day, all the way to the coast on horseback. I continued doing more explorations, seeking out different routes. Ones that were shorter, longer, drier, less steep, more steep, with a variety of lodging. We went on foot, on horseback, by motorcycle, and by car. In 2011 I combined my two loves, Parelli Natural Horsemanship and trekking, by starting the treks with a two day workshop taught by 5-Star Parelli instructor David Lichman. In 2012, David returned and we expanded to include 4 other instructors. By July 2012 we had completed 11 treks to the beach, 75 guests had made the journey with us. Today we have made so many treks that I have lost count and we have expanded and improved our routes to three distict areas of Costa Rica. 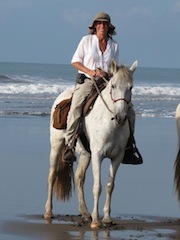 We have been fortunate to have hosted many certified Parelli Professionals to teach workshops and join us on our treks. The instructors who have joined us so far include: David Lichman, Nita Jo Rush, Teri Sprague, Christine Madoni, Susan Nelson, Maurice Thibault, Keri April, and Julia Bell. We have learned from each instructor’s individual style of teaching the Parelli method and our horses have benifited from this learning. Several of the instructors continue to return year after year. The treks have become part of our lives, the lives of the Parelli instructors and the lives of the Costa Rican people along the trek routes. In the past we have accomodated groups as large as 15 horses. Now we choose to keep the treks small, with a limit of 6 guest riders per trek, so that we can provide an individualized and personal trekking experience. I personally ride all the treks, I know the trails and the people very well and love sharing their stories and translating conversations to facilitate a rich cultural exchange. I limit the treks to a maximum of 4 per season so that they remain exclusive adventures designed to facilitate the discovery of a country and it’s people. This personal journey is enriched by the relationship you develop with your equine partner and the friendships that are nurtured over the course of the trek. We invite you to join us on one of our trekking adventures this season.